Then there’s Kyoko, the little girl, who behaves much more like a real little kid than in most anime (though…they are starting to overdo the whole “poop” thing–just like a little kid would!). Miyazaki is famous for his believable and loving depiction of young children, which again was particularly strong in My Neighbor Totoro. I wonder if the main pair of sisters in this show was in fact explicitly modeled after the two girls in that movie. This episode introduces some more complicated and potentially darker aspects that are promising: though, I did kind of blanch when the Encoder, Yuko Amasawa, turned out to be no older than the main characters and joining the class. She was hitherto depicted as seeming much older, and in a similar kind of role as Kirima Nagi in Boogiepop Phantom. It almost seems too coincidental and convenient to have all three in the very same classroom…but aside from that, the next episode looks even more interesting as it appears the girls start a computer club of some sort, perhaps to compete with the Investigating Agency run by Megabaa. Maybe they could call it the Homebrew Cyber Club or something. <–massive computer nerd joke/reference. 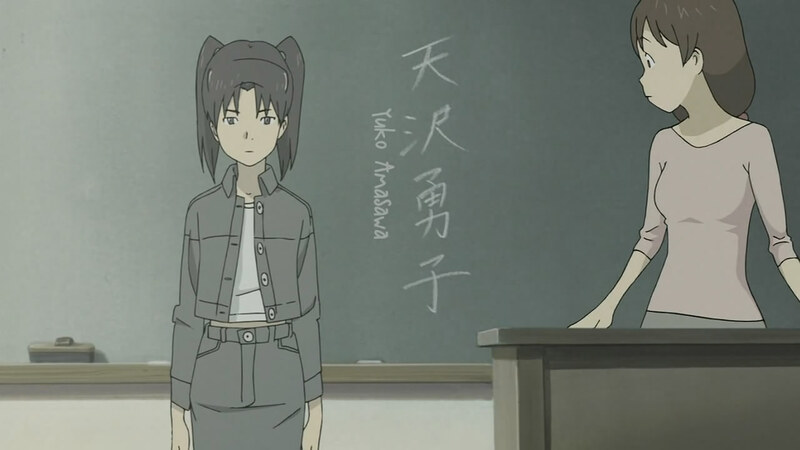 We also now understand something better about the significance of keyholes, which, probably, is going to take on some sort of metaphorical significance eventually if this show heads into Lain territory like I think it will…. ….especially with the kind of director we have at the helm. You see, through Wikipedia, I learned a little bit more about the director and creator of this show, Mitsuo Iso. He was a key animator on several Studio Ghibli projects, including Porco Rosso and Only Yesterday–which explains the Ghibli-like flourishes in this show. Also, he was responsible for most of the digital effects in RahXephon, in which he also wrote and directed one of the most notable and moving episodes of that series (specifically, ep. 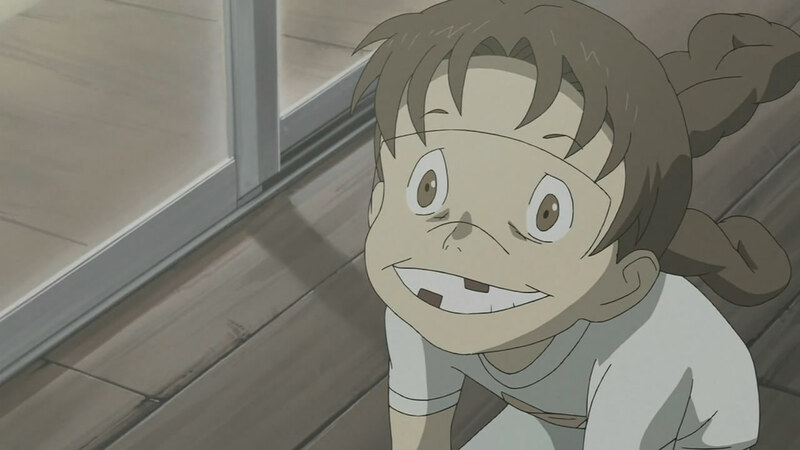 15, “Childhood’s End”), and helped write one of the more clever episodes of Evangelion (“Lilliputian Hitcher”–which, with its focus on organic networks, computer evolution and hacking, shares some common themes with Denno Coil!) That track record makes this a lot more promising than I even thought before…I’m definitely going to be following this show with interest. It looks like Denno Coil is one of the more obscure shows of the season–it’s only gotten two fansubbed episodes so far, and I only heard about it in passing from one of my other anime watching friends (hi Fred!). When he described it as Lain-like and about kids, I was intrigued. I’m a fan of quiet, reflective types of shows that talk about important things, like Lain, and when I saw the promo video for the series on Youtube, the vibe I immediately got was a Bokurano one: serious, tasteful, possibly dramatic. It followed that I downloaded it that night and gave it a spin. What was it like? It’s definitely original, for one, in its approach to an otherwise well-traveled topic. The first two episodes do a very good job explaining the “rules” of this cyberworld without getting too bogged down in exposition (with some exceptions), and by throwing us in the middle of the action we got a good sense of who the antagonists, the obstacles, and the special features of this world are. And those special features are cute for ex-sysadmin-admin me: huge network admins named Saatchis who are cute and deadly, reformatting as a destructive moving wall, and cyberdogs who chase around “illegal functions” and viruses. Sure, this is a bit unrealistic, and this cyberworld is much more like a video game than a real network, and I think the idea of having a grandma be an uberhacker is also somewhat expected for this kind of story–but, dang it, it was funny to watch. I didn’t expect to be laughing quite so much in this show when I first saw it, given its rather serious and tasteful OP and ED songs (which, again, reminded me of Bokurano’s–heck, Bokurano’s “Uninstall” is even more computer-related than the ones in this show). Which leads me to another point: is this a kid’s show? 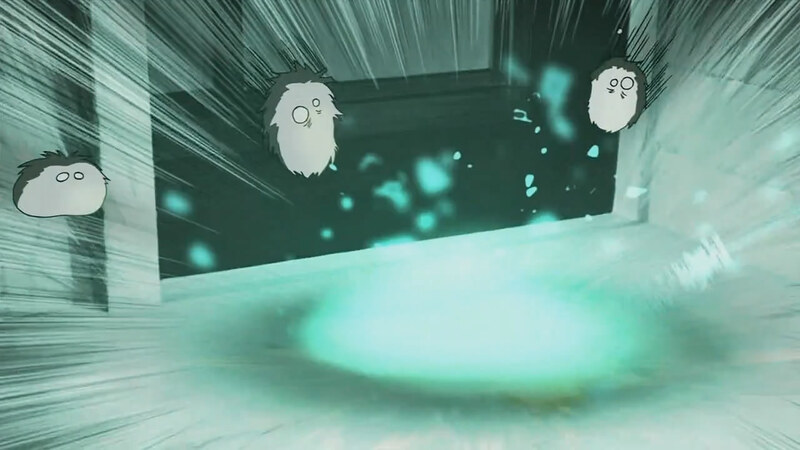 I notice that the protagonists are not only quite young, and primarily concerned about the fate of a pet, but that the station sponsoring this is none other than public TV station NHK. 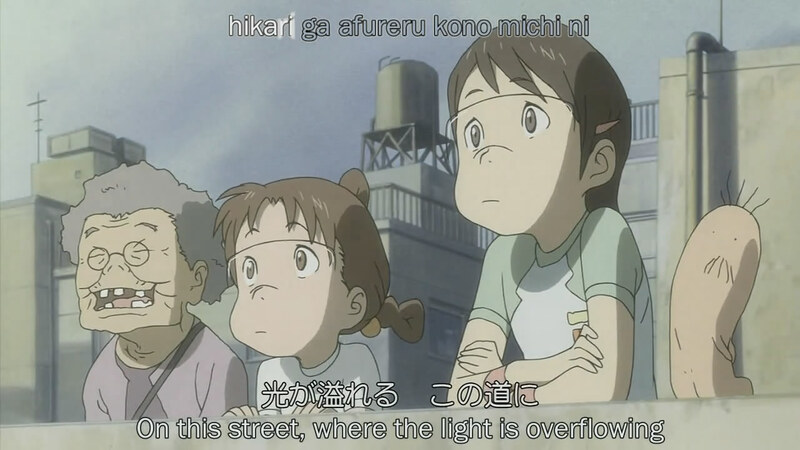 NHK, if I recall correctly, primarily shows anime aimed at younger viewers. (Classic example: Gainax/Anno’s first TV series, Nadia. Despite the fact that it had a very Anno ending.) The tone of the show is whimsical and playful, though there are already hints of something darker along the horizon. Has anyone read the manga and gotten a glimpse of what’s coming? I notice too that this whole show is directed, written, and conceived by one Mitsuo Iso, which is often a good sign that there will be relatively little creative compromise and more originality. There are certainly a lot of inventive uses of the whole “Matrix”/”Wired” concept, though at this point they seem more cute than threatening. Anyways, this quiet little show looks interesting just to see how they handle the various computer concepts. 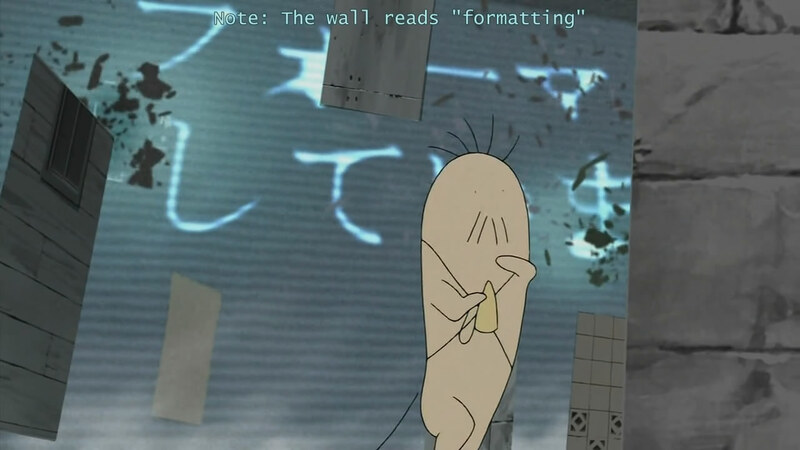 I’m always pleasantly surprised when the creators of anime get computer details right (like they often did in a good bit of Chobits) and have always liked the whole cyberpunk genre, like the Ghost in the Shell: Stand Alone Complex series and Lain. Let’s hope this will be yet another worthy entry in the genre.